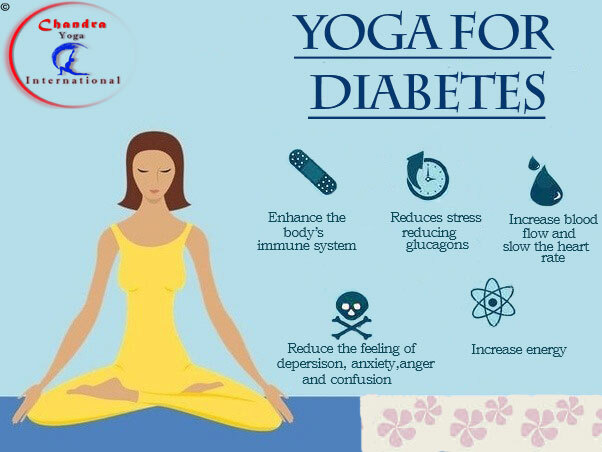 Home meditation for diabetes sun salutation for diabetes yoga asanas for diabetes yoga benefits of diabetes yoga for diabetes yoga schools in Rishikesh yoga teacher rishikesh yoga training India Yoga for Diabetes. Diabetes is a group of metabolic diseases characterized by high blood glucose (hyperglycaemia). This may be due to defects in insulin secretion, insulin action, or both. Insulin is a hormone secreted by beta cells of langerhans located in the pancreas. Regular yoga practice reduces blood sugar levels, blood pressure, weight, progression speed to complications and severity of complications. Symptoms are also significantly reduced, as are the number of hospitalized patients with diabetes. 1. The secretion of glucagon is enhanced by stress. Yoga helps reduce stress by reducing glucagon and possibly improving insulin performance. 2. Weight loss induced by yen is a well-accepted mechanism. 3. Relaxing muscles, developing and improving blood supply to the muscles can improve the expression of insulin receptors on the muscles, resulting in an increase in glucose uptake by the muscles and thus a decrease in blood sugar. 4. Blood pressure plays a major role in the development of diabetes and its associated complications, which proves that it uses yoga. The same applies to elevated cholesterol levels. 5. Yoga reduces adrenaline, norepinephrine and cortisol in the blood, which we call? Hormones of stress? This is a mechanism that improves the effect of insulin. 6. Many yogic attitudes to be produced extend to the pancreas, which may stimulate the pancreas function. Sun Salutation is a good exercise for diabetics, increases blood flow in different parts of the body, improves insulin in the body, gives you all the benefits of exercise if it is exercised at 4 revolutions per minute. If you use slow speed, it offers asana benefits. Asanas are beneficial in the treatment of diabetes. An important aspect of Asanas is the stability and comfort in position. Stretching of different glands results in improved endocrine system effectiveness. Asanas such as Dhanurasana (lying down), Ardhamatsyendrasana (semirenual circles), Vajrayana Yoga Mudra, Muktasana Pavan, Sarvangasana, Halasana, Matsyasana were useful in diabetes. These asanas have a positive effect on the pancreas and functional insulin. There are many types of Pranayama mentioned in Hatha Yoga. One of the basic preparations for Pranayama is Nadi Shodhan Pranayama or alternate breathing of the nostril; this type is useful in diabetes as an alternative to nostril breathing has a calming effect on the nervous system, which reduces stress levels, helping in the treatment of diabetes. Also showing that Bhramari and Bhastrika Pranayama help in diabetes. Bharamari has a calming effect on the mind, brain and nervous system. Bhastrika Pranayama revitalizes Pranayama, which increases oxygen levels and reduces carbon dioxide levels in the blood. The practice of meditation is helpful in stress management. Especially for diabetes, concentration on the pancreas during the practice of meditation has shown positive effects on sugar levels. One can even visualize the proper functioning of the pancreas, the correct administration of insulin in the body to help in the treatment of diabetes. Yoga Nidra is a very important process of deep relaxation; it helps to relieve stress and has very good positive effects on the whole body-mind complex. Master cleaning or Shankha Prakshalana is recommended for diabetes, complete Shankha Prakshalana takes 1 day and is recommended once in 6 months, but a smaller version of it can be done 3 times a week. This process completely cleanses the gastrointestinal tract. This process is done by drinking 2 glasses of hot water, and the juice is added to that. In effect, a well-planned and regular exercise regimen can be very beneficial if it is a part of everyday life, more so if one has diabetes. Exercise has the advantage of controlling the blood sugar levels without taking any additional medications. Overall regular exercise can not only help in better control of blood sugar but also helps with the control of weight and blood pressure as it lowers the bad cholesterol and raises the level of good cholesterol in the blood. Exercise can reduce the risk of heart disease and nerve damage, the risks of which are higher with diabetes. With bistroMD you know that you will not only eat gourmet meals, but that every entree and each in bistroMD's weight loss program will be balanced to bistroMD's designed nutritional platform that's promoting an healthy diet. STEP 2 - View your menu in advance and select the entrees you would like for each day and week.